Blessings Come In So Many Different Ways...Congratulations To Dr. Beverly Nuckols! In life there are so many blessings bestowed on us that it is hard to keep count. Yes, there are the obstacles that make life difficult but these obstacles are the very ones that propel us to do better. Obstacles are like a tempest, when the storm has passed we appreciate so much more of what we do have. I have been blessed to have parents that gave God all the glory. My father in particular has always been and still is, even in his state of mind, a strong family man and a great patriot. The love I have for my God, country and family, I owe to my parents and especially my dad. Having said this, I am extremely blessed to have a husband that not only supports my work financially, but helps with my tasks as a blogger. One sister in particular keeps me abreast to the most current political news as this job has grown beyond my dreams or expectations. It may be my passion, but working as a blogger has become a family venture. Even my sons and grandchildren have become involved. Ten years ago we moved from our native San Antonio to the hills of Comal County, and we have never looked back. Moving involves leaving childhood friends and going from the familiar to the unfamiliar. Sometimes changes are not always what we envision. We did not set out looking for friends; we didn’t even want to find things to do as we were moving to the country for a ‘quiet’ life. Instead, we moved into a community that had just started to bloom. It was so busy, so involved that it was difficult not to meet new people and dive into our new challenges. Friends develop from mutual activities and most of all shared goals and interests. Friends can be the biggest blessings because they are connected without obligation. I have talked about Dr. Beverly Nuckols on numerous occasions as she has contributed many articles for the Conservatives In Action Reports. 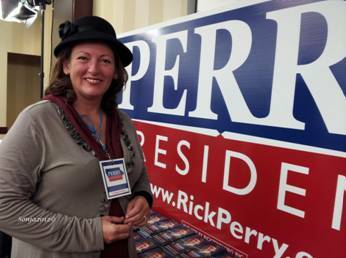 We travelled to Washington DC to attend CPAC-12 and just before that to the Iowa Caucuses to support Governor Rick Perry in his bid for the GOP presidential nomination. 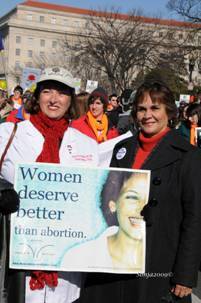 In January of 2009 our husbands went with us to the Right to Life March in Washington DC. We both are bloggers for TexasGOPVote and we both went to The Woodlands, Texas for the Gingrich-Cain Debate. We have participated in so many events that have to do with Pro Life that I really have lost count. There is something very special about Beverly; she likes me in spite of all my imperfections. How can you not love a friend like that! By the way we do not always agree on everything, in fact, in some instances, we even support different candidates! It is with a great deal of pride and pleasure that I announce Dr. Beverly Nuckols’ appointment to Governor Rick Perry’s board on Texas Institute of Health Care Quality and Efficiency. Beverly Nuckols of New Braunfels is a board certified family physician in private practice. She is a member of the Texas Medical Association, American and Texas academies of Family Physicians, Comal County Medical Association, and Texas Physicians Resource Council, and former medical director and a past board member of New Braunfels Hospice. She is also a member of the National Advisory Committee on Violence Against Women and Texas Association Against Sexual Assault, and past vice chair and a past board member of the Comal County Women's Shelter. Nuckols received a bachelor's degree from the University of Texas at Tyler, and received a medical degree from and completed her family practice residency at the University of Texas Health Science Center in San Antonio. She is appointed for a term to expire Jan. 31, 2013. Nuckols, a board certified family physician in private practice, has lived in New Braunfels with her husband, Larry, since 1993. She is a member of the Texas Medical Association, American and Texas Academies of Family Physicians, and the Comal County Medical Association. 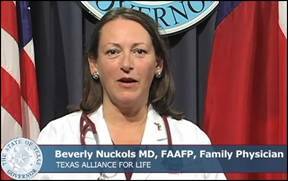 Nuckols serves on the Board of Directors for Texas Alliance for Life, New Braunfels Options for Women and is the Chair of the Family Medicine Section of the Christian Medical and Dental Association. She has served as a member of the National Advisory Committee on Violence Against Women and the Texas Association Against Sexual Assault, and a board member of the Comal County Women's Shelter and New Braunfels Hospice. Nuckols received a bachelor's degree from the University of Texas at Tyler, and completed medical school and family practice residency at the University of Texas Health Science Center in San Antonio. She received a Masters in Bioethics in 2007 from Trinity International University in Deerfield, Illinois.